My very first wildlife ecology field job was in 2008 assisting a graduate student, now Dr. Jen Walsh, collect data on Nelson's and Saltmarsh Sparrow nesting ecology. These sparrows are globally vulnerable to extinction because they are an obligate saltmarsh species- a habitat that is in steep decline. When you consider the impacts that climate change and rising sea levels will have on the species, their plight becomes more dire. That summer found me stomping through saltmarshes, jumping ditches created by tidal flows, and pulling my hip-waders out of the sucking mud. Saltmarshes were a fascinating place, teeming with avian life. Jen and I recently connected again in 2017. 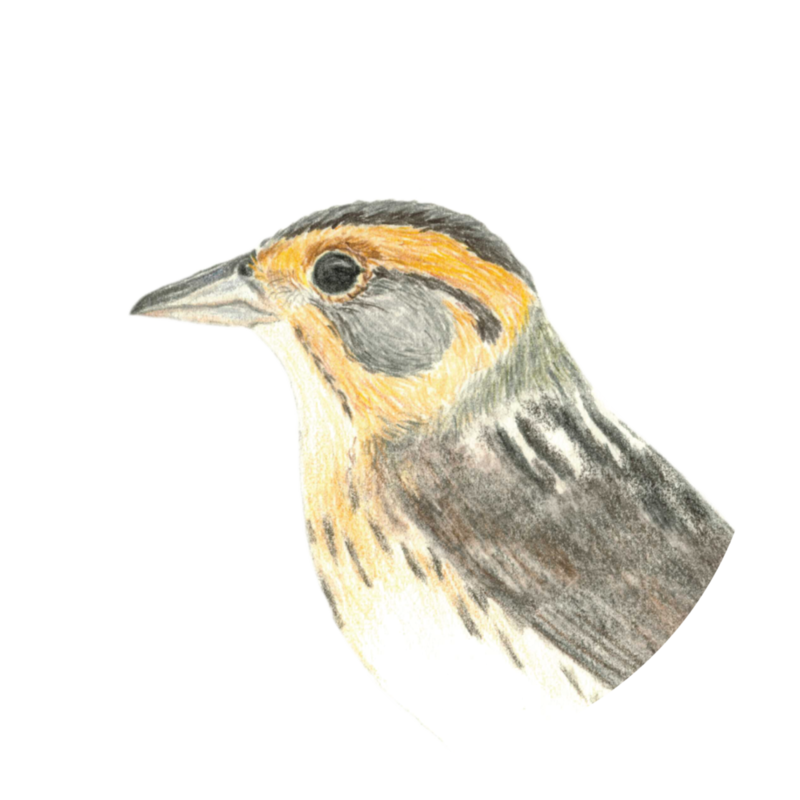 She was working on a publication and needed images to clarify a range map of sparrow subspecies. I was able to create some drawings for her, and they ended up getting used in one of her maps. Check out her publication here! You can find more art like this in my Scientific Illustration portfolio. I continued my Saltmarsh adventures in 2009 after graduating from the University of New Hampshire. An internship with Biodiversity Research Institute (BRI) took me to the coast of Maine where I spent the summer mist netting and banding various species of Saltmarsh birds. We also collected blood samples from birds to investigate mercury levels in the ecosystem. Learn more about BRI's research on mercury in wetlands.